I got a free sample of this fragrance at work. It's called Laugh With Me Lee Lee. And it's a perfume from Benefit. It smells really good, not too potent but just enough to last. I can't really describe what it smells like; smells a bit flowery but refreshing as well. 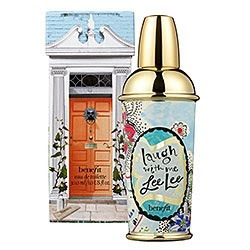 There are other fragrances from Benefit which I'm sure smell pleasant as well. looking so cute and nice!